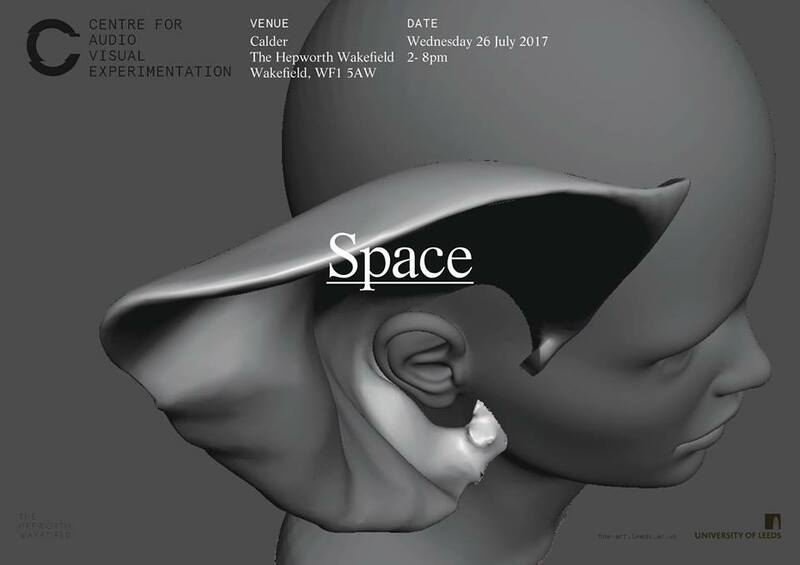 In association with the Hepworth Wakefield, and the University of Leeds Centre for Audio Visual Exploration, I organised an afternoon and evening of performances and workshops which examine listening in the context of the spatial environment. There was an active listening workshop, featuring a set of bespoke acoustic listening devices, as well as a set of performances of works that explore the acoustic properties of the calder through sound by Stuart Mellor, Alvin Lucier and myself. The Listening Devices designed by architect Lara Karady and sound artist / composer Alex De Little modulate sound according to specific aspects of our auditory sense, such as the ability to sense direction, the ability to perceive frequency, the ability to hear the distance of an object, or the ability to hear at all. Devices resonate, channel sound, block sound, and amplify sound in certain ways. They are activated by users’ movement and interaction, and each device provides an opportunity for a particular approach to listening. This workshop explores the Listening Devices in the context of a series of games, which use the devices to explore our engagement with listening through movement and singing. In these games everybody is a listener, but each listener is also participant, performer and audience member. In this context, a series of individuals morph into an interdependent group whose characteristics are constantly morphing and contingent on the interrelationships between each and every listener. Resonant Propagation presents an opportunity to explore the microscopic time spans of frequency and the dimensional qualities of sound pressure waves. The piece is organised as a series of sections, which “zoom in” and bring the minute rhythmical structures at play into a perceivable domain. Four speakers have been placed at four exact positions that relate to four frequencies which have been discovered in the Calder. These resonant frequencies are sound pressure waves with wavelengths that are directly proportional to the dimensional properties of the space. Vespers is based on the principle of echolocation and takes inspiration from the navigational capabilities of bats. Four blindfolded listener-players navigate their way around a large space through the use of pulsed sounds emitted from sondols— megaphone-like handheld loudspeakers. The pulses emitted by the sondols reflected by the space create an acoustic signature whose complexity is gradually revealed as participants scan the space. Lucier describes this process as like, ‘taking slow audio photographs of the space’. Vespers is performed by Charlotte Sadd, Tora Hed, Hannah Buckley, and Stuart Mellor. Every site has its own harmonic language; resonant frequencies are acoustic phenomena whose wavelengths are directly related to a given set of spatial configurations and dimensions –a site’s breath– born directly from shape and material construction. They energetically reinforce themselves and are perceived as both louder and less directional than a non-resonant frequency. When resonant frequencies are played into a space, they create interference patterns, a landscape of areas of high and low sound pressure. Dancers Tora Hed and Hannah Buckley improvise around these topologies, creating choreographies in direct response to them. Movements and actions correspond to the physical distribution of sound in the space. The structure of the piece is defined by shifts in the awareness of the dancers, the evolving composition of the physical sonic topology and the physical presence of the audience. I am Sitting in a Room subjects speech to an iterative process of recording and playback in a given space such that it gradually reveals the resonant frequencies in that space. Initially, speech is read live into a room whilst being recorded, and through a pair of tape recorders it is iteratively and simultaneously recorded and played back into the space. With each iteration, the recording accumulates acoustic colourations from the room, until the climax of the piece when the speech becomes unrecognizable: information conveyed through speech turns to expression of the space conveyed through ‘music’.